Art entries being judged… | How important is Art in our life? A judging session underway at the Kendriya Vidyalaya Sangathan Regional Office Guwahati during a judging session for selecting the Best Regional entries for a National Level competition on Save Fuel Save Energy. Seen in the picture from extreme right. 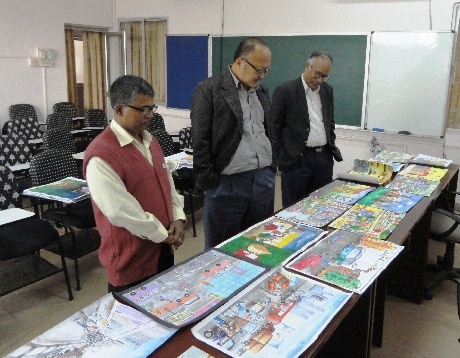 Mr Nagaraju, Assistant Commissioner, Mr.Subba, Deputy Commissioner & Mr.Saha, Art Teacher.